Visiting the Arctic region where the frozen see opens in summer months to allow nature enthusiasts to see the tundra, Polar Bears and its magnificent glaciers is truly stunning. Sailing as north as possible is also every travelers thrill. Come visit the Arctic and be a Polar explorer! Take flight from Mumbai (India) to Oslo. On arrival proceed to airport hotel for overnight stay on bed and breakfast basis. After breakfast proceed to airport for your flight to Longyearbyen. Arrive in one of the world’s northernmost towns. Longyearbyen is the largest settlement on Svalbard. A very friendly and international atmosphere reigns here where there is a population of about 2,060 people and about as many snowmobiles. Most of its inhabitants are Norwegians, but some are Russians. Located in the Advent Fjord at the entrance of the Advent Valley, this community has an infrastructure fit for a much larger city. The community offers a wide range of activities and facilities for visitors. You have some free time when you can visit the main street and the museum. 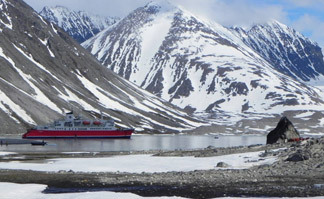 Embark the ship in the afternoon and depart Longyearbyen in the evening. During these six days, visit ice-covered seas, fjords with breathtaking mountain scenery and glaciers flowing into the sea around you. Each day will be planned to take advantage of local ice and weather conditions. Distances are relatively short in the Archipelago and as there are no ocean crossings, the seas are normally calm. Svalbard is one of the few places on the planet that offers such a wealth and diversity of natural and cultural history sites. This is also a land of history from whaling to reaching for the pole, to trapping, coal mining and war. Visit intriguing historic sites. You may cruise in Zodiacs along the ice edge viewing seals or walrus, in fjords with glaciers spilling down to the sea or in front of spectacular seabird cliffs. You will have opportunities to walk on shore, observe and photograph the Arctic flora and fauna. Krossfjord, Konigsfjord, Monaco Glacier, Hinlopen Straiit, Ny-Ålesund, Northeast Land, Edgeoya, Hornsund and Bellsund are just a few of the places that you may visit. By not having a set itinerary, you take on an expedition spirit and are free to take advantage of the best that Svalbard has to offer. The evening of your last full day of adventure will find the expedition ship anchored off Longyearbyen. Return to Longyearbyen where the journey began. Say farewell and reflect on your extraordinary Arctic adventure. Early morning disembarkation and airport transfer is offered for passengers with flights scheduled after 4 am. For passengers disembarking at the regular time of 8 am, you will be transferred to the airport of the Radisson Blu Hotel, depending on flight times. Travelers transferred to the hotel will have an opportunity to explore the town center on their own, and then be transferred to the airport later in the day, as per flight schedule. Transfer times will be confirmed and communicated onboard prior to departure. Luggage storage at the Radisson Blue Hotel will be available until the time of departure. On reaching Oslo stay at the airport hotel on bed and breakfast basis. As a requirement of participation on the ship, all passengers must purchase medical and emergency evacuation insurance with a minimum medical coverage of $200,000 USD and this insurance must cover personal injury, medical expenses, repatriation expenses, and evacuation expenses. Clients must be able to provide proof of insurance purchase and adequate coverage as per the required amounts above. We also strongly recommend that all passengers purchase comprehensive travel insurance which would include coverage for cancellation, trip disruption, baggage and personal property. Damle Safaris will process this for you. Spacious accommodations; all meals onboard (excluding drinks other than coffee, tea and water); shore excursions and Zodiac cruises; services of expedition staff and naturalists; lecture and educational programs; complimentary rubber boots on board; round-trip Longyearbyen airport transfers depending on your flight details; expedition parka; and a Arctic destination guidebook. Airfare; travel insurance (required); passport and visa fees; gratuities are at your discretion; items of a personal nature including laundry, alcoholic and non-alcoholic beverages (except coffee, tea and water); optional excursions; kayaking. *Shipping terms and conditions applicable. Trip cancellation and emergency evacuation insurance as per actual. Fuel surcharge & port charges might be applicable at a later date. 1. This tour is not refundable.